A Russian Soyuz spacecraft carrying a cosmonaut and two NASA astronauts undocked from the International Space Station Thursday, fired its braking rockets and plunged to a pinpoint landing in northern Kazakhstan. Dropping out of a hazy, overcast sky under a bright orange-and-white parachute, the descent module settled to a jarring, rocket-assisted touchdown at 11:46 p.m. EST (GMT-5), bringing spacecraft commander Fyodor Yurchikhin, flight engineer Shannon Walker and Douglas Wheelock back to Earth after 163 days in space. Russian recovery crews, along with U.S. and Russian flight surgeons and other officials, rushed to the spacecraft to provide assistance and to welcome the crew members home with traditional offerings of fresh fruit and warm blankets to ward off the sub-freezing temperature at the landing site. 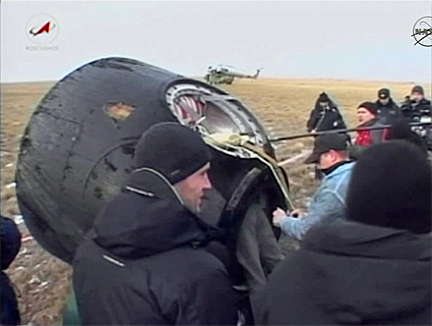 The descent module tilted over on its side after touchdown in light winds. "This was a bulls-eye landing, no question," NASA spokesman Rob Navias reported from the landing site. 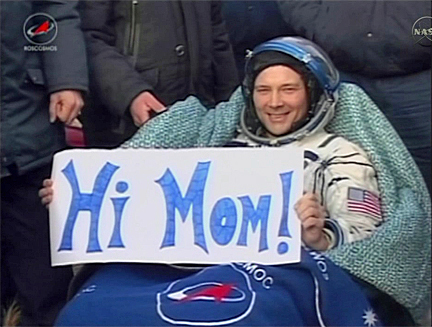 "Conditions were just perfect for a Soyuz landing today." After medical exams, Yurchikhin, Walker and Wheelock were to be flown to Kustanai for a more formal welcoming ceremony. After that, the crew planned to split up, with Yurchikhin flying back to Star City near Moscow. Walker and Wheelock planned to fly directly back to the Johnson Space Center in Houston. The trio was launched to the space station June 15, boosting the Expedition 24 crew back to six after the earlier departure of three other crew members. In late September, Wheelock became commander of the Expedition 25 crew, which later included NASA astronaut Scott Kelly, Alexander Kaleri and Oleg Skripochka. 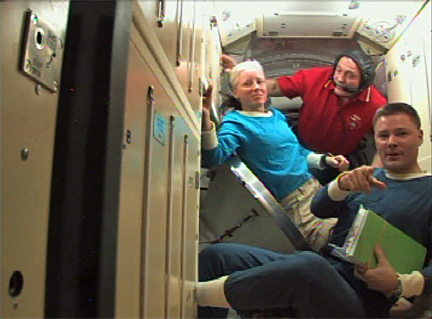 With the departure of Soyuz TMA-19, Kelly, Kalari and Skripochka became the core members of the Expedition 26 crew. They will have the station to themselves until Dec. 17 when three fresh crew members -- Dmitri Kondratyev, Catherine Coleman and Paolo Nespoli -- arrive aboard the Soyuz TMA-20 spacecraft. 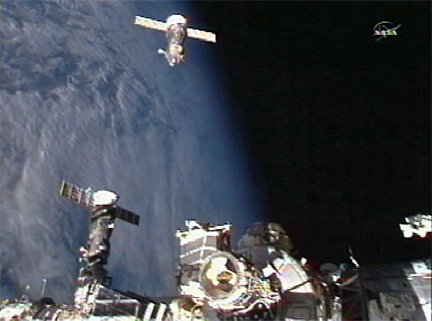 Yurchikhin, Walker and Wheelock undocked from the space station's Rassvet mini-research module at 8:23 p.m.Thursday to begin the long trip home. After moving a safe distance away from the station, Yurchikhin monitored a four-minute 21-second rocket firing starting at 10:55 p.m. that slowed the craft by about 258 mph and put it on course toward the targeted landing site. After a half-hour free fall, the Soyuz TMA-19 descent module fell into the discernible atmosphere at an altitude of about 63.5 miles at 11:23 p.m. Parachute deployment was normal, and the capsule touched down without incident. Two-and-a-half hours after undocking from the International Space Station, the Soyuz TMA-19 spacecraft carrying Fyodor Yurchikhin, Shannon Walker and Douglas Wheelock fired its braking rockets at 10:55 p.m. EST (GMT-5) Thursday to begin the trip back to Earth. The four-minute 21-second rocket firing 220 miles above the south Atlantic Ocean slowed the craft by about 258 mph, putting the returning crew on course for a landing at 11:46 p.m. in northern Kazakhstan near the town of Arkalyk. An updated status report will be posted after landing or as conditions warrant. 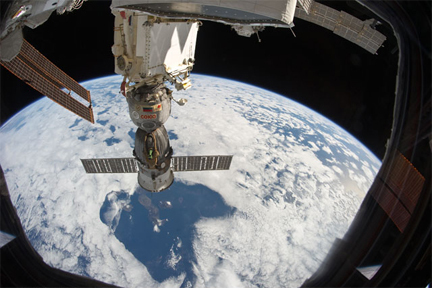 Soyuz commander Fyodor Yurchikhin, flight engineer Shannon Walker and Douglas Wheelock undocked from the International Space Station at 8:23 p.m. EST (GMT-5) Thursday, on track for landing in northern Kazakhstan around 11:46 p.m. to close out a 163-day stay in space. With Yurchikhin strapped into the center seat of the Soyuz TMA-19 descent module, flanked by Walker to his left and Wheelock to his right, the spacecraft separated from the space station's Rassvet mini-research module and began moving away in a carefully choreographed procedure. "Going soothly, separation fine," Yurchikhin reported. If all goes well, Yurchikhin will oversee a computer-controlled de-orbit rocket firing at 10:55 p.m., a four-minute 21-second burn that will slow the craft by about 258 mph and put it on course for re-entry and landing just north of Arkalyk, Kazakhstan. Touchdown is expected at 11:46 p.m.
After a final round of hugs and handshakes, outgoing Expedition 25 commander commander Douglas Wheelock, flight engineer Shannon Walker and Soyuz commander Fyodor Yurchikhin floated into their Soyuz TMA-19 spacecraft Thursday afternoon, closed the hatch at 5:14 p.m. EST (GMT-5) and prepared to undock from the International Space Station. Landing in Kazakhstan is targeted for 11:46 p.m. In a live downlink from the space station, Wheelock, Walker and Yurchikhin could be seen saying farewell to Expedition 26 commander Scott Kelly, Oleg Skripochka and Alexander Kaleri before making their way into the cramped Soyuz module docked to the Rassvet mini research module. Undocking is expected at 8:22 p.m.
"All right. Good luck, you guys," Kaleri said just before the hatches were closed. "Everything looks good." There have been no problems so far this evening and Russian flight controllers report the Soyuz TMA-19 vehicle is in good shape and ready for undocking. Outgoing Expedition 25 commander commander Douglas Wheelock, flight engineer Shannon Walker and cosmonaut Fyodor Yurchikhin are set for a fiery return to Earth Thursday evening (U.S. time) aboard a Russian Soyuz capsule to wrap up a five-and-a-half-month orbital tour of duty. 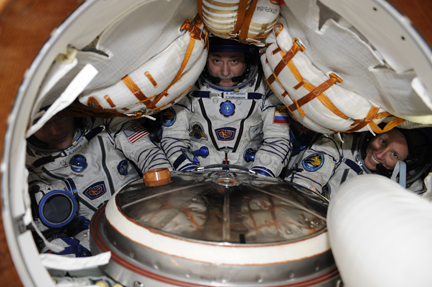 After bidding Expedition 26 commander Scott Kelly, Oleg Skripochka and Alexander Kaleri farewell, Wheelock and his crewmates plan to float into the Soyuz TMA-19 spacecraft around 4:50 p.m. EST (GMT-5), sealing the hatch and donning their re-entry pressure suits. If all goes well, the spacecraft will undock from the Rassvet mini research module around 8:22 p.m.
Soyuz commander Yurchikhin, seated in the descent capsule's center seat, and Walker, strapped in to his left, will oversee a computer-controlled four-minute 24-second deorbit rocket firing starting at 10:54:30 p.m. that will slow the craft by about 258 mph and put it on the proper trajectory for re-entry and landing 48 miles north of Arkalyk, Kazakhstan. At an altitude of about 87 miles, the three modules making up the Soyuz TMA-19 spacecraft will separate and the central crew module will orient itself heatshield first for the plunge back into the atmosphere. Three minutes later, at 11:22 p.m., the descent module will reach the discernible atmosphere at an altitude of 63.5 miles. Eight minutes after atmospheric entry, parachutes will deploy, slowing the craft for a landing at 11:46 p.m. to close out a mission spanning 163 days and seven hours. Russian recovery forces will be stationed nearby, along with U.S. and Russian flight surgeons to help the returning station fliers re-adjust to Earth's gravity. After medical exams, all three crew members will be flown to Kustanai for a traditional welcome ceremony. After that, Yurchikhin will be flown back to Star City near Moscow while Wheelock and Walker will be flown directly to the Johnson Space Center in Houston for debriefing and rehabilitation. "It's been a great ride," Wheelock said Wednesday before turning command of the station over to Kelly. "I think Shannon, Fyodor and I, when we launched back in June, we came up here with great expectations and although expectations were met ... the way our mission played out was in a lot of ways different than what we had planned. "But it was very, very exciting, we saw a lot of exciting things happening with the advent of the full utilization of the space station as an orbiting science laboratory. That's come to full fruition for us now as we've got over 130 experiments going on board. It's just been a real thrill to be able to work with all of the scientists and engineers and researchers on the ground." In August, Wheelock and Tracy Caldwell Dyson, who returned to Earth in late September, staged three dramatic spacewalks to replace a faulty ammonia pump module that disabled one of the space station's two main coolant loops. The complex repair job worked, and the station was brought back up to full power. Wheelock, Walker and Yurchikhin had hoped to welcome the shuttle Discovery's crew to the station earlier this month. But Discovery ran into a series of technical problems and launch, originally scheduled for Nov. 1, has now been delayed to no earlier than Dec. 17. "We've had some challenges in the way of maintenance and things in the past several weeks and months, events that really challenged us as a crew, challenged us a team," Wheelock recalled Wednesday. "And we've come through it a better station and a better crew for it." Turning to Kelly, he said "Scott, it's my great honor and pleasure to relinquish command of the International Space Station to you, my friend and crewmate." "Thank you, Doug. I assume command," replied Kelly, a veteran shuttle commander. "t's a real honor and a privilege to take command of this great ship, the International Space Station. 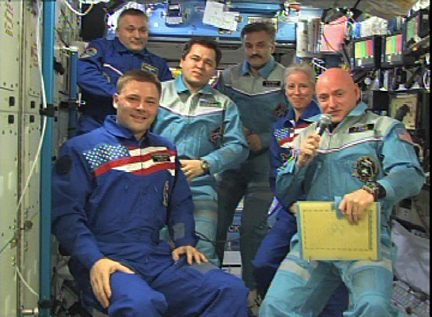 I look forward to leading the Expedition 26 crew on a great mission. Thank you." The crew then took a break for an early Thanksgiving dinner. "Shannon and I have been here now since the middle of June and it's been an incredible experience, an incredible journey traveling through the cosmos around our Earth and looking out at our beautiful planet," Wheelock reflected in an earlier Thanksgiving message to the ground. "I'm very, very thankful for the things that we have on board here that keep us safe and keep us busy and keep us sharp. I'm thankful for my crewmates and thankful for the good Earth and looking forward to coming home." Said Walker: "I just wanted to wish everyone well this Thanksgiving. I hope everyone is surrounded by friends and family and are enjoying the wonderful Thanksgiving dinner together." Kelly, Kaleri and Skripochka will have the space station to themselves until Dec. 17 when three fresh crew members -- Soyuz TMA-20 commander Dmitri Kondratyev, NASA astronaut Catherine Coleman and European Space Agency astronaut Paolo Nespoli -- arrive two days after launch from the Baikonur Cosmodrome in Kazakhstan. "I'd like to wish everyone a very, very happy Thanksgiving," Kelly said. "I am very thankful to be a crew member on board the International Space Station. This is really an amazing vehicle. I'm thankful and I feel privileged that I was born and grew up in a country that could be major contributors to something as magnificent as the International Space Station."